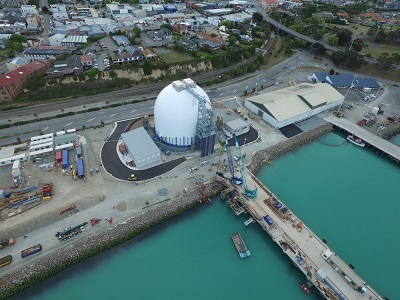 Over the last two plus decades Domtec has designed and constructed monolithic concrete bulk storage domes worldwide. 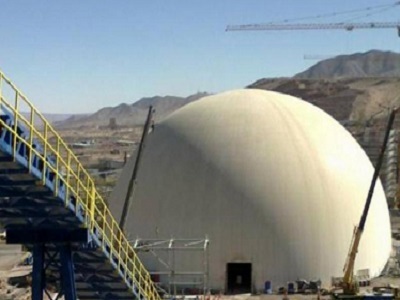 Whether a dome is storing a heavy material like iron ore, cement powder or clinker, or a lighter product like wood pellets or some fertilizers, each dome is unique in its geometry, location and bulk material properties stored. 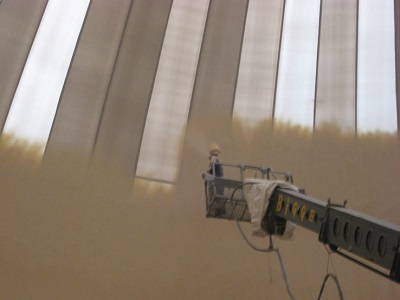 Domtec’s world-class experience includes constructing insulated, reinforce concrete domes while applying ACI and Eurocode engineering with varying seismic, wind and differential loads on 5 continents, a majority of states in the USA for the mining, biomass and cogeneration power, agricultural and cement industries. Many of those reinforced concrete domes are built near rivers, oceans or areas with poor soil characteristics. 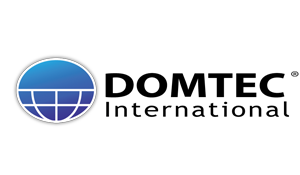 Domtec has a culture of integrity, reliability and flexibility. Whether a client needs a concrete dome builder for cement, clinker, fly ash, fertiliser or other bulk material storage project, or turn-key EPC contractor for site, geotechnical or structural engineering, reclaim tunnels, ringbeam and deep foundation, bulk storage dome or SiloDome™, floors, conveyors and reclaim system, Domtec’s experience and relationships with expert partners will build an owner’s material storage project safely, on-time and economically. Starting from conceptual design, order-of-magnitude budgets or firm bids, the goal of Domtec International to save the industrial plant time and money and build a relationship of trust for life. 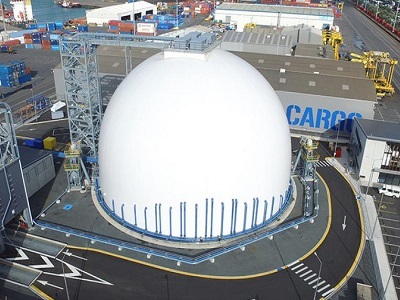 When compared with conventional storage, metal buildings or concrete silos, domes will have a longer life cycle, lower maintenance cost and in most cases a smaller storage and reclaim cost per ton of product. 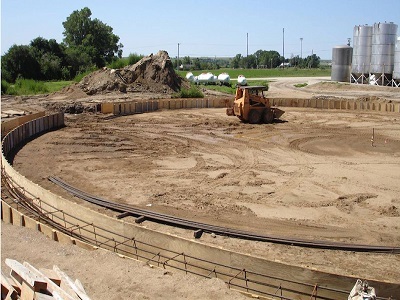 Depending on soil bearing capacity, geotechnical reports and any optional subgrade reclaim tunnels, a continuous circular ringbeam foundation is engineered and constructed. When complete all material and equipment needed for construction are moved into position inside the foundation. A custom fabricated DomeSkin™ waterproof exterior roofing membrane is attached to the footings and inflated. Depending on the size of the dome, this process takes minutes to couple of hours. 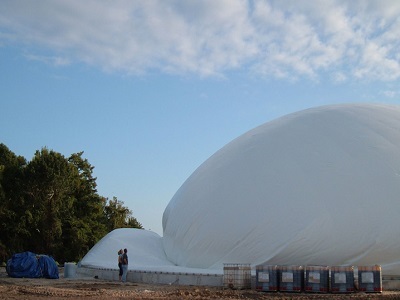 New inflated, the construction process is completed from inside the dome avoiding costly weather delays. The polyurethane foam insulation applied by the Domtec technicians provide initial rigidity and a thermal barrier from the outside elements protecting the concrete and dry bulk storage produce from extreme freeze-thaw cycles and condensation. Rebar is attached to the foam providing additional rigidity and a skeleton structure for the concrete. 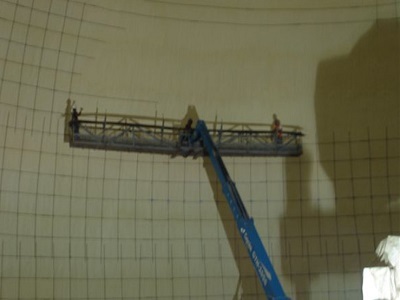 Additional layers will be placed in the dome depending on the engineering specifications. With the first mat of rebar hung shotcreting begins. 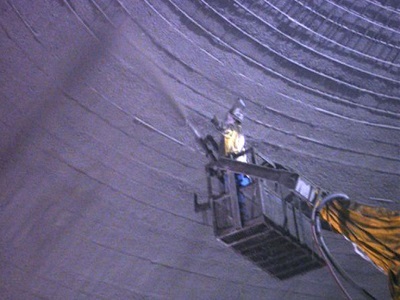 Shotcrete is applied in thin concentric layers intermittently with the installation of additional cages of rebar and until depth gauges are covered.